Dream Castle gained a second successive impressive turf Group race victory at Meydan, UAE, as Godolphin dominated the finish of the nine-furlong G2 Al Rashidiya on week four of the Dubai World Cup Carnival, Thursday, 24 January. 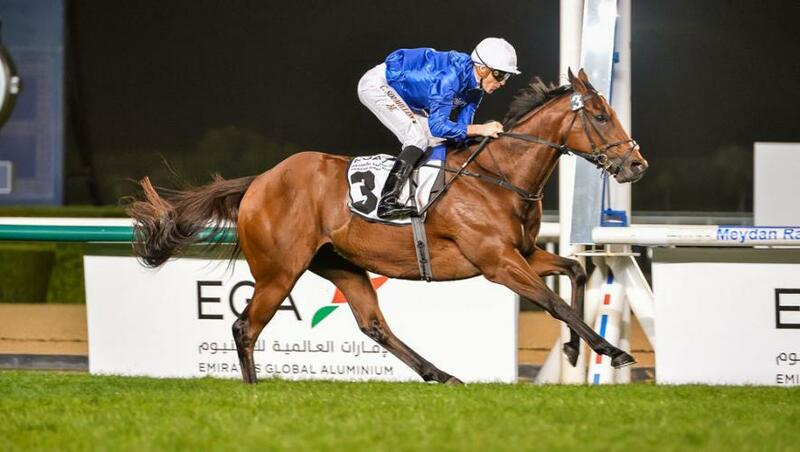 The five-year-old, successful over the same course and distance in the G3 Singspiel Stakes on Thursday, 3 January, readily beat stable companions Leshlaa (Pat Cosgrave) and Racing History (Kevin Stott) to provide trainer Saeed bin Suroor with a 1-2-3 in the race, while Godolphin also had the fourth Blair House (Charlie Appleby/William Buick). Dream Castle was soon covered up in fourth on the inside by Christophe Soumillon as Bay Of Poets (Charlie Appleby/Brett Doyle) led from Racing History, with Leshlaa and Blair House held up towards the rear of the nine runners. Bay Of Poets continued to hold the advantage at the top of the straight but was collared with a furlong and a half to race by Dream Castle, who soon quickened away sharply and went clear of his rivals. Dream Castle was eased near the line to triumph very well by three lengths in 1m 48.24s on good turf, with Street Cry horse Leshlaa staying on gamely to finish a nose in front of Racing History, with a further length and a half back to the keeping-on Blair House in fourth. Saeed bin Suroor reported: “It was good to see Dream Castle run a good race for the second time this year and he could go the same way as Benbatl, who won the same two races last year. “Dream Castle is doing really well and I liked the way he finished his race. He is tough and showed a very good turn of foot, while he also looked more relaxed tonight. It is a good sign for the future. “One of the options we have is the G1 Dubai Turf on Dubai World Cup Night (Saturday, 30 March), but Sheikh Mohammed will make the decision. Christophe Soumillon commented: “I was well-drawn in stall three today and the pace was good. “On the home turn, I was focusing on the horse leading who was going really well and when I saw James [Doyle] could not follow him, I picked up on the inside and Dream Castle reacted really well. “Dream Castle likes to have horses in front of him. As you saw when I hit the front, he looked around for a few strides, but he gave me a really nice turn of foot again. “He has changed a lot since his last run – he was speedier today and his action was smoother. I think he can still improve on that run. “He is a really nice horse for the big races. He has got natural speed and can be one of the horses for Godolphin on the big nights - that is for sure. Kevin Stott added: “Racing History is a very genuine horse. He has had a few problems, but he loves it out here with the sun on his back and fair play to the horse he has run really well today.